The headline on the Telangana and Andhra Pradesh elections from a national perspective is the Federal Front, which is the dream of the current Chief Minister and strongman of Telengana, K Chandrasekhar Rao ( KCR), who sees this non-BJP, non-Congress coalition as the third force in Indian politics, with him moving from effectively being the Nizam of Hyderabad to a star on the national stage: king-maker if not king. Last year, he moved quickly to encash the chips of support he had provided the BJP at various times since 2014 and got the centre to approve early assembly elections in Telangana in December 2018. Once again, he swept these winning more than 80% of the seats. Having clobbered the Gatbandhan of the Congress and Chandrababu Naidu in December's state election, KCR is ready to repeat the same in the Lok Sabha election next week. Having run a gamut of welfare schemes and development programmes, KCR is confident of winning 16 of the 17 seats in the state. As he puts it, only some opposition candidates' "kismet" could allow him to lose a seat or two. And the numbers suggest this is not a hollow claim. 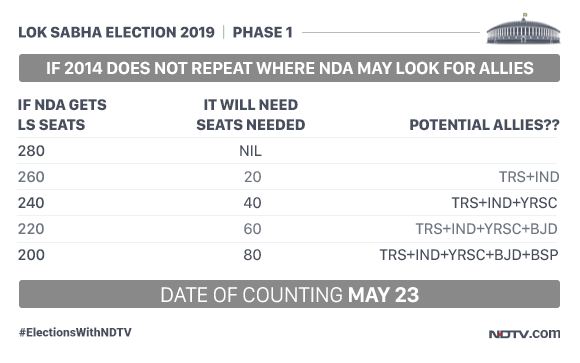 NDTV analysis shows that if you translate KCR's December assembly victory into Lok Sabha seats, he would get 16 of 17 seats. And only a swing of more than 7.5% away from his party, the TRS, would see it get less than 15 seats. That's a huge and unlikely change given that the assembly results are less than six months old. The Congress, now an even poorer shadow of itself in Telangana, has lost 10 MLAs to KCR's party since the December election. With its organisation in tatters, party officials give the Congress little hope of winning more than a couple of seats, although they bravely claim to be in a fight for five seats. So with a minimum of 14 seats and a maximum of 16, KCR knows he is in the sweetest of all spots- placed to choose who to support because he is confident neither of the two national fronts will emerge with an absolute majority. And while he attacks the BJP publicity and calls their five years in power a flop, he is pragmatic enough to have been working, since December, back channels to ensure enough contact with both sides. It's also easy to see why his Federal Front ambition is not without weight. The entire eastern coastline of India plus Telegana is ruled by non BJP/Congress governments. With a 144 parliamentary seats in this belt and the possiblity of regional parties winning almost 106 of them, the Federal Front could be much more than a bit player. That forecast of 106 seats is broadly based on opinion polls. To these numbers, one could add the BSP/SP alliance of perhaps 40+ seats, the Janata Dal, NCP, Left parties and other smaller parties. Of course, some of these parties are allied with the Congress, but politics and election results can change allegiances very quickly. Since December, KCR has quickly canvassed Chief Ministers and party leaders of leading non-BJP/Congress states for their support. 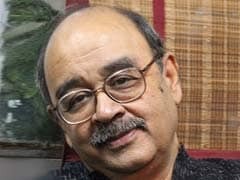 And while the response may have been muted, he knows that the germ of the idea has been planted and if the NDA were to slip below the critical threshold of a majority, it would need friends. Enter KCR. The one deal he does have on the table is with Jagan Reddy, the leader of YSRC and potentially the winner of the elections in Andhra which has 25 seats. Opinion polls show Jagan likely to win anything between 19-22 of them. KCR is clear that they will be a combo offering in May. Jagan is in agreement. 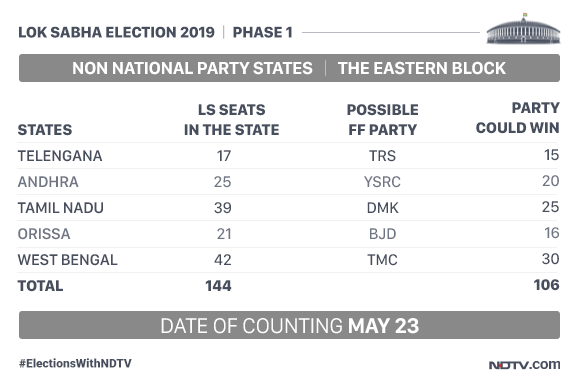 And this could be the combination that the BJP is most likely to need since, as a pair, Jagan-KCR are placed to reach around 35 seats ( YSRC 19+TRS16). This number compensates for almost exactly the number of Sears that the BJP is predicted to lose in UP. If the BJP's losses are larger , the more persuasive KCR's voice will be with other regional leaders. As a solid bloc, they will be able to bargain harder for what he believes in - a more federal system. That's something that all regional parties want. The problem gets more complicated if the Federal Front actually becomes the largest "force". With many leaders, the competition to be first among equals could derail everything. But that's a problem for later.